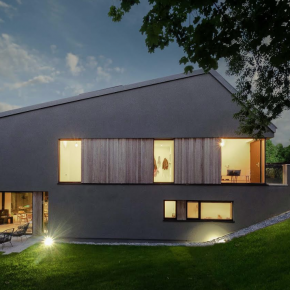 This contemporary property saw designers Simply Architecture elect to use a timber frame construction, manufactured by ECO Timber Frame, Carrigaline, Cork. This property was designed by Gareth Sullivan, of Simply Architecture, for his own family. The brief was to combine innovative construction methods with an energy-efficient home to overcome the challenges of a problematic site. As a RIBA and RIAI accredited practice, Simply Architecture excels in well-crafted bespoke projects. Gareth is also a Certified Passive House Designer. Gareth commented: “Our family home (measuring 1900 square feet) is set into a very difficult small and steeply sloping site in Douglas. The site is compromised by three existing wayleaves which allows access to service pipes that restrict the area available to a small wedge-shaped space. All of this means the build had to be energy efficient and use innovative building methods to make it easier to build on this challenging site. 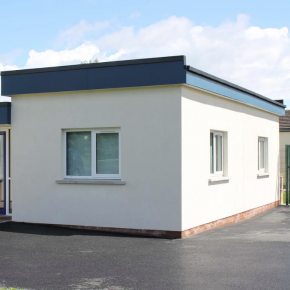 In order to incorporate both elements, Gareth selected a timber frame construction with a cement board and a multi-coat render system. The Passive House certified timber frame system created by ECO Timber Frame uses 90% less energy than conventional construction designs. In addition, this typically includes key features of high thermal insulation and very low U-values with almost no thermal bridging. A very high level of air-tightness, passive gains utilising solar panels, and a MHRV – mechanical heat recovery ventilation system – are incorporated in the design. In order to reduce time and costs during the early stages of construction, much of the fabrication work was carried out off-site, which greatly benefit project efficiencies, ease of access and site cleanliness. Stephen Spillane, joint owner of ECO Timber Frame, commented: “Much of our work is with the one off and self-build sector. 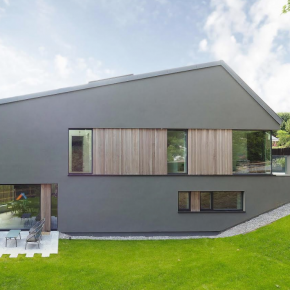 “It was clear from the beginning that Gareth was committed to building to Passive House standards. This worked out nicely as their timber frame system was awarded certification at around the time the construction took place. A construction system using an EPS insulated foundation with a timber frame structure proved to be the most efficient method. The timber frame is a certified Passive House system, with an overall thickness of 362mm to the external walls, which have a U-value of 0.12 W/m²K. Weber is a leading manufacturer of innovative materials, systems and solutions for the construction industry. Its weberend MT multi-coat system has BBA certification, which meets NHBC requirements for new build housing. This is vital, as builders and developers in this field are constantly seeking modern methods of construction for speed and cost efficiency. The weberend MT system is designed to rapidly finish buildings of frame and panel construction. weberend MT is a light-weight render system which incorporates glass-fibre meshcloth reinforcement with a resin-rich adhesive coat. It can carry a choice of finishes in a wide range of colours. This modern render system is designed for large areas of stable render carrier boards without the need for expressed joints. This allows it to create smooth, modern design aesthetics. weberend MT is also suitable for uneven masonry or mixed substrates where a high level of crack resistance is required. Application onto a panel background requires an initial 3mm pass of weberend LAC. The glass fibre reinforcing mesh is laid in, as this coat takes up, and a second 3mm of weberend LAC is applied. Sponge finish achieves a flat surface. When fully dry, weber PR310 primer is applied prior to the finish. A variety of textured finishes in a selection of colours can be used to produce stylish, weatherproof, vapour permeable protection. The weberend MT application was carried out by Michal Sasinowski of M S Plastering, Glanmire, Co. Cork. Sasinowski found it interesting to see this unique design, and the fast build program achieved with off-site construction. 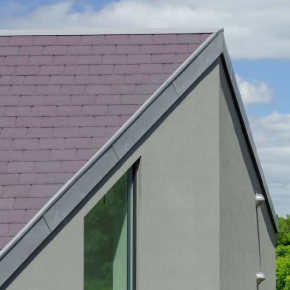 weberend MT system was hand applied to achieve uniform colour and texture using the Welsh Slate colourway for a contemporary and attractive look. Weber products are manufactured in the UK at sites in Bedfordshire, Shropshire and Co Antrim. This guarantees efficient availability and lead times, adding to the company’s sustainability policy, reduced CO₂ emissions and transportation costs.